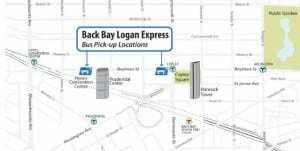 New Logan Express Transportation from Back Bay to Logan! Logan Express will now run direct from Back Bay to Logan Airport! There will be two locations for pick-up and drop-off which are Hynes Convention Center and Copley. The bus will run on a 20-minute schedule and run throughout the day. Fares are $5 per passenger; however, if you have a current MBTA pass, you can ride for free! For more information or to view the Back Bay Logan Express schedule, please head here.